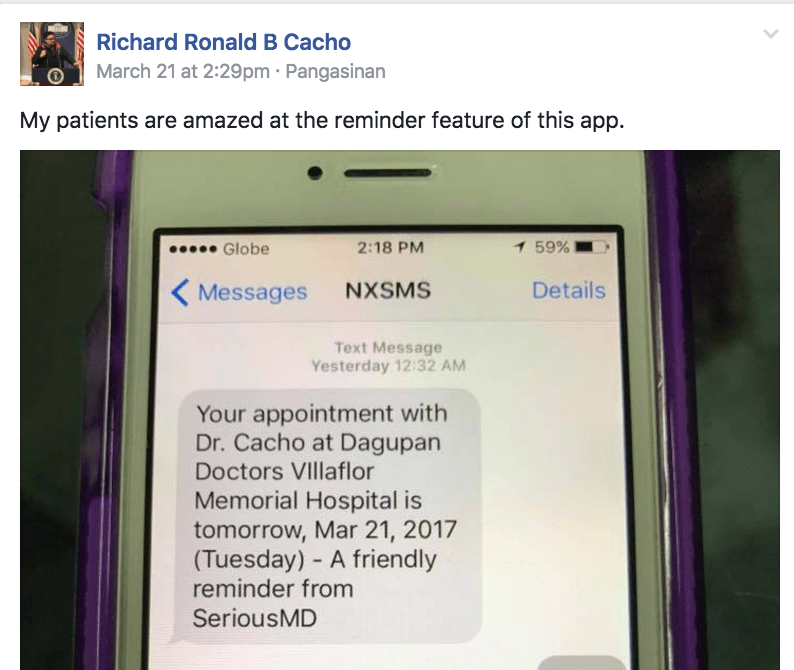 We’ve gotten a lot of great feedback over the past year on how doctors are using SeriousMD in their clinics. On the flip side, we’ve gotten responses too from doctors who still haven’t found the time to get started with it. We interviewed several doctors and asked them about the topics below. We wanted to know how the doctors who did make the switch to digital managed it and what they faced. In so doing, we hoped to get added insight into how more practices can do the switch smoothly. We asked for the reasons that made them hesitant to switch initially. We asked them to elaborate on each one and explain how they got past the hurdles. We asked them to sum up what drove them to sign up and commit to electronic records in spite of their fears. We needed to know the motivations that got them over their initial fears. There’s usually a story behind everything we do and we wanted to get those from our users, in order to learn better from them. We asked the doctors to explain their processes and try to distill their insights into actionable tips for others eager to make the switch. The idea was to identify actual challenges and solutions for them. We interviewed 50 doctors, either face to face or over the Internet. From there we got the following data. We were able to identify the common obstacles that hold back a doctor from getting started on EMR software. Looking at that list, it’s basically the same list of reasons from the doctors we interviewed who won’t or haven’t switched yet from paper records. This might suggest that even those physicians might be able to get over those hurdles too, in the future. All of the reasons in the list are very real concerns that we’ve addressed already in one form or another with SeriousMD… except for the last one. There’s nothing we can really do about that, however. Cultural resistance to change is something every organization has to face at one time or another. Our own advice on the topic is to involve staff in the transition (to turn the process into a participatory one) as well as register their pain points when they do arise. To paraphrase an old but still-very-relevant piece from the Harvard Business Review, employee resistance is less something to overcome than something to address. It tells you something may be out of adjustment, so you need to tweak something to get your ideal result. At any rate, each of the doctors we interviewed found a way to get past their initial reasons with enough motivation. For most physicians we interviewed, we got 2-4 reasons why they wanted to switch and got started with digital records. There’s 1 issue that they needed to solve, like reminding patients, billing, tracking HMO's, etc. They were already using a scheduling app and/or an app for keeping track of billing/finances, why not an all-in-one app? After committing to using electronic medical records, things can get scary and daunting really fast. It’s why a lot of doctors stop early on. But as you can see from the table of motivations above, there are a lot of reasons to brave the early bumps. And in fact, there are a lot of people who do it! If there’s anything our research shows, it would be that many if not all physicians are truly capable of overcoming the first hurdles. That’s why we tried to find out how the doctors who acted on their motivations for switching actually did it. How were they able to make the transition and get over the obstacles? Here are the things we learned from doctors who did it, on how you can easily switch from paper records to electronic records. Changing habits is hard for many people. It’s important to not pressure yourself and just take one step at a time. The transition will take time. It’s the same with other new things in life. There’s always a time in the middle when you need to learn and get used to something new before it becomes truly comfortable. Some doctors say that they want all patient records already inside the app before they even want to try using the app. That’s not impossible. In fact, it’s definitely possible for us to help if the data is already in digital form. But if it’s in paper form, well, that’s a different matter. Different, but not insurmountable. As you can see, Doc Joselito takes it one step at a time. Though he’s operating in full digital now, he still has paper records in his file cabinet from past patients. Slowly but surely, he and his staff are clearing off his old paper records and freeing up more space in his clinic along the way. This gradual approach makes sure you don’t bite off more than you can chew instantly. It’s a great compromise for people who hate feeling overwhelmed by change. This is why it pays to have a flexible EMR solution. Each doctor is unique in how they like to do things. Once you understand that the software is there to help, then you’ll see the different possibilities of how it can be used to fit your needs. Some doctors love their ultra-complete notes with super-organized patient schedules but some doctors have a hard time typing, so they write it down directly on the app. Some write on paper, then snap a picture of it before throwing the paper away. Some just take a picture of their paper form and just draw/write on top of it inside the app. Some doctors get more calls from pharmacists than others. Exploring the printing of e-prescriptions helped them remove that pain. In terms of your daily process of doing things, you can easily integrate the EMR if you just play around with the tools to see which one fits best. Be open to see what works for you. My habit is, before a patient comes in, I always look at the previous notes, so I already have an idea and I can easily refresh my memory. After that, I’ll call the patient. – John Andrew Michael Bengzon, M.D. Test the waters before diving in. This tip basically says to try out an EMR with just a few of your patients at the start. Find out how you’d prefer to do things and see how it helps you. The more you use it over the next few weeks, the more you’ll build momentum and eventually, it’ll be easy to switch. Obviously, one of the easiest ways to switch is to have support from your staff. If they like it and are willing to explore it, then it’s much easier for you. But what if you can’t fully trust your secretary yet? What if your secretary isn’t really the techie type? Slowly introduce it to them. Identify their tasks, convert it to how it’s done inside the app, which is probably the same, then just let them practice. Remember: if they can use Facebook or play Candy Crush, then they can type in a patient’s name, schedule an appointment date and input blood pressure information. Importing patient records can be easy if you use the tools provided. There are apps to help you be more mobile or help you take pictures when you need to. Make use of the tools at your disposal. Have old paper records? Easily take pictures to import them in an organized manner into the EMR. Want to import your patient list? Import in bulk. Having a toxic day and can’t type as much? Just take a picture of your paper notes. I didn’t attempt to retype my old patients’ charts. I just took a picture of the charts and saved them under the doctor’s notes then also took a pic of the labs and results and saved them under health records but edited the date to when they the Xrays or labs were done. Thanks to you for putting the photo option in the doctor’s notes. That way they are still chronological. And this way it is easy to glance at their old charts. That’s what I do when I have old patients that recently followed up. It helps when your secretary is familiar with the app. My secretary does all the digital capture of my old charts. – Byron S. Angeles, M.D. Look at how having an EMR can benefit your practice. Look at the time you save for filing records. The space-saving aspect, the ease of access and more. Think about when your secretary is absent. Think about how often you need your charts but can’t until you get to a specific clinic. There are a lot of benefits and once you realize how it helps you, you’ll be more motivated to get started. I get to access all the records, all at once. It’s a BIG WIN. – Maria Teresa Ribano, M.D. With most doctors we get to talk to, it’s fairly common to hear them say that doctors are not sociable with others but very sociable when it comes to their fellow doctors. I personally look at it in a similar way. After being able to speak face to face with many doctors, I think the better way to phrase it is that they’d like to do and figure things out on their own and trust colleagues when it comes to answering their questions. When it comes to switching to an EMR, doctors tend to keep to themselves and just figure it out. Many interviewees did the same thing and got through it but recommend that it’s important to ask questions of your vendor and be open to communicate. This will halve the time you spend learning the software while giving your own feedback to improve it and make it work better for you. Author’s Note: Yes, you can actually talk to us. We’re not robots. After getting feedback, looking at the top answers and accounting for factors like the different specialties, localities, number of clinics, physician ages (38-68) and career stages, there’s one thing that stood out as the main reason for switching quickly from paper records to digital ones. It’s a physician’s desire to be better for his/her patients. Most of the physicians we talked to had a general idea of the ways an EMR would benefit them. More importantly, though, they had a sense of how it would benefit their patients. This awareness of how they could help others more effectively seemed to be the greatest common denominator among the motivations for doctors who decided to go digital. Looking cool doing it doesn’t hurt as well. This study will end here for now, but we’ll revisit it in a future post. We plan to dive further into what drives change in a physician’s workplace. We also want to learn how more physicians all around the world can learn from their fellow doctors about technology. There’s been some friction between tech and healthcare for some time now. It’s partly because there hasn’t been enough dialogue between key stakeholders in both fields. We aim to change that. We want to talk to you, find out what you need, and help you get it. Through the SeriousMD platform, we want to help you be the best physician you can be, while making it easy for you to do your work, grow your practice and connect with your fellow doctors. Talk to us now by telling us what you think of this study in the comments or on Twitter/Facebook! You can help continue the conversation too by sharing this study on social media, where others can see it and weigh in on their own feelings about EHR/EMR tech. This entry was posted in SeriousMD Academy and tagged converting paper records to ehr, moving from paper to electronic health records, moving from paper to electronic records, paper charts to electronic medical records, paper to electronic records. Bookmark the permalink. ← How Do Electronic Medical Records Improve Patient Care?